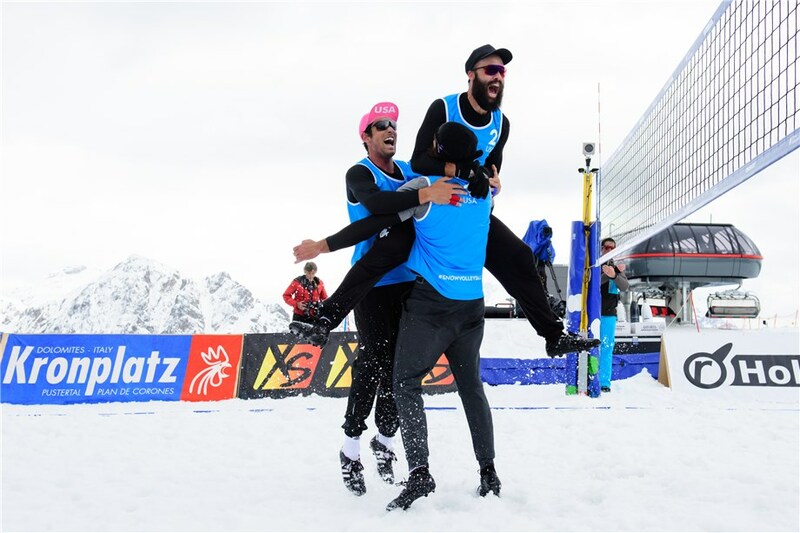 PLAN DE CORONES/KRONPLATZ, Italy, April 7, 2019 – Maddison McKibbin, Riley McKibbin and Troy Field, participating as United States 2, claimed their country’s first ever men’s medal in international snow volleyball after a victorious run from Thursday’s qualifications all the way to Sunday’s spectacular gold medal match at the second stop on the FIVB Snow Volleyball World Tour in Plan de Corones / Kronplatz, co-organized with the CEV. The silver medal went to the team of Russia 1. The Russians have been the dominant power on the men’s CEV Snow Volleyball European Tour in recent seasons, but have yet to achieve their first gold on the World Tour. For Pavel Rakusov, Yury Bogatov, Nikita Kusmin and Petr Bakhnar, this silver is the second medal on the Tour after their Wagrain-Kleinarl bronze last week. The team of Poland completed the podium. The bronze for Piotr Groszek, Karol Szczepanik, Kamil Warzocha and former multiple European King of the Snow Michal Matyja is the first World Tour medal for the central European country in either gender. The men’s final was the big jewel of the whole event and a brilliant ending to an exciting tournament. With Pavel Rakusov leading the way in attack, the Russians were well in control of the first set. The battle intensified in the second set as both teams put on display the highest level of snow volleyball. USA were more concentrated in the final moments to tie the match and prompt the breath-taking tie-breaker, which crowned the eventual winners. In the epilogue, extended deep into overtime, both sides saved multiple opponent match points. High-flying Troy Field was doing his magic in both offence and blocking, but it was Maddison McKibbin, who hammered the last point to shape up the 2-1 (9-15, 15-13, 22-20) American victory for the gold. Aleksandar Boricic, FIVB 2nd Executive Vice-President and CEV President, awarded the gold medals and the trophy to the well-deserving champions, who completed a winning streak of seven matches on the Italian snow. “To start from the bottom of the qualifiers and to find ourselves in the final and win it by 22-20 in the tie-break – that’s as good as it gets! We are fired up! This exceeded our expectations by far and beyond. We never imagined that this could be this amazing. It’s like you are in heaven. This is what heaven looks like!” exclaimed Riley McKibbin immediately after the final. “Russia are a great team! Amazing! They really brought a beach style that we haven’t seen before. We were just trying to stay steady and in the second set we just came together as a team. We are extremely grateful for Italy, for the FIVB for a chance to play, let alone win for our country,” Troy Field added. “We started this expedition two weeks ago. We had never played snow volleyball in our lives. To climb the peak of the mountain and win an FIVB World Tour event – god, it feels good!! !” concluded an elated Maddison McKibbin. Earlier on Sunday, USA 2 reached a 2-0 (15-12, 22-20) quarterfinal win over Slovenia and a 2-0 (15-6, 15-13) semifinal victory over Austria, last week’s gold medalists at Wagrain-Kleinarl. Russia 1 enjoyed a 2-0 (15-11, 15-9) shutout of Brazil and a hard-fought 2-1 (15-12, 10-15, 15-10) win over Poland. Austria and Poland exchanged emphatic set wins on the way to a tie-breaker in the bronze medal match. They engaged in a dramatic third-set battle for the last remaining spot on the podium. When it counted the most, the Polish players were more concentrated and it was Kamil Warzocha, who put the ball on the snow for the winning point – 2-1 (15-8, 6-15, 15-13). After the match emotional Karol Szczepanik announced that it was his son’s birthday, so with Michal Matyja as the lead singer, the spectators at centre court greeted Szczepanik junior with the Happy Birthday song.